Deconstructed Pork Tacos Bento, a photo by sherimiya ♥ on Flickr. Remember the slow-cooked ono pork roast from last week? This bento is an example of repurposed pork leftovers. I sliced some pork and fried it to get nice crispy edges, then packed it with tomato-onion-cilantro salsa and rolled tortillas for him to either build a taco at lunch, or eat separately as he chooses. 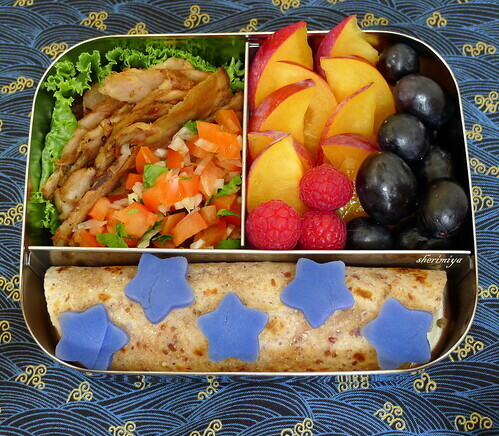 I decorated with Okinawan sweet potato stars, and added late-season pluots, black grapes and raspberries. Yes, I know I'm using the same three-sectioned LunchBot Trio as I did for the original pork bento, but it's because this box is so ideally suited for deconstructed meals like this one. I've used it numerous times already, and it's still in great shape -- maybe a little scratched with tiny dents, but the lid still fits securely and the welded partition seams have held up without fail. Love it. this has to be one of my favorite bento's you have ever done. LOVE LOVE LOVE IT!